Universal tube gift boxes without any printed content, just have the function of storage and protection for products, cannot play the role of promotion. The large round gift boxes are printed with carefully designed contents on the packaging box to reflect the distinctiveness of the products and the distinctiveness of the brands as well as to exert more functions. 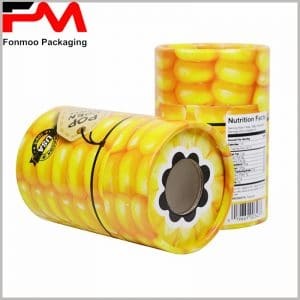 We are a specialized supplier of custom tube box packaging, always offering your customers a variety of different styles and sizes of cylinder packages. This is a beautiful gift boxes for shoes, using a cylindrical box packaging style, the size is very large, used to hold high-end ladies high heels. The package uses cardboard of 250g as the raw material, but two different materials are used on the surface. Gold cardboard affixed to the packaging of the inner surface and the edge of the roof, making the product box packaging look luxurious, as a gift needs a very high-end packaging; others are based on white single copper paper as tissue, with gold to make contrast against the background. If there is no product or brand logo, this package can only be an ordinary packaging, consumers cannot see through the packaging what belongs to this product, but also know nothing about the brand. However, in the center of the top cover of the tube boxes, the gilding process, the printed “high heels” words, the brand name and the logo make the entire package at a glance, with very good publicity. 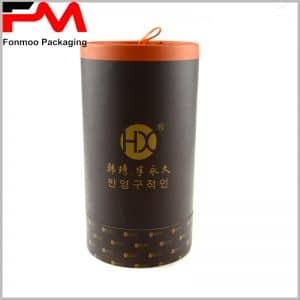 Large-size cardboard round gift box packaging is very rare, but we provide you with a custom cylindrical packaging with very large size, the height and diameter are based on the actual situation of the product. To make your packaging more attractive, there are a wide variety of printing processes that can be selected, and the use of specialty paper will make the package better.